In the summer of 1948, the Province of Ontario was experiencing a shortage of qualified teachers. This resulted in the hiring of recent graduates of Grade 13 on an emergency basis. I was one of these. When I met with the Separate School Inspector, Mr. Anderson, in my search for employment as a teacher, he tried to dissuade me, citing my lack of training and my age; I had just turned eighteen. I knew that he was right, but I needed the work. From the list he reluctantly gave me, I contacted Tommy O'Connor, the secretary of School Section #1, Hagarty, and was hired, sight unseen, in late August. I was told that I could board at the home of Big John and Kate O'Grady, a mile from the school. 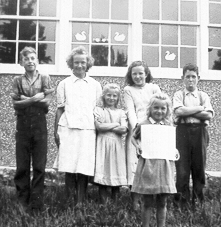 On the Saturday before the opening of school, my father drove me to the Drohan home in Eganville where his first cousin, Veronica, was preparing to return to her position as teacher in Coniston. She spent an hour or so coaching me on how to teach printing to beginning pupils, and she passed on hints about class control. After dinner, Dad and I headed for Killaloe and the O'Grady Settlement. When we had gone through Old Killaloe, and had begun the long trip up the hill, we stopped in at the home of a Polish family where a wedding reception was in full swing. Dad had been told that the O'Gradys would probably be there, and they were. We were greeted warmly and invited to stay for the party, but Dad wanted to see me situated up at the house and get back down the hill before dark. So, after meeting Big John, Kate, and their thirteen year old son, Bernard Sullivan, we left. Kate told us that the house was open, that my bedroom was to the left at the head of the stairs, and that I should make myself at home. They would be home later. When we reached the O'Grady house, we were met by a friendly dog that allowed us in. Dad helped me up to my room with my few things, and then set off for home. I had trouble getting to sleep, alone and uneasy in this unfamiliar house, and disturbed by the sound of horses walking on the rocky ground. At first I thought that they were right below my window, and was surprised to find that they were a field away. I was relieved when the 0'Gradys and Bernard came home and settled in for the night--Bernard in the room next to mine, and John and Kate in the open area at the head of the stairs and to the right. The next day, we went in their Model A type car to Mass in Brudenell, six miles across the hills. Only these older model high-riding cars were suited to the rutted road. The center was high enough in places to damage the undercarriage of the newer, lower cars. Kate assured me that no boyfriends would come to call because, if for no other reason, the road would discourage them. She proved right. De somno surgere , hora est! For years I had a copy of this little gem but I've lost it. During the time I spent with him on this and other weekends when Grace came for me by horse and cutter, I got to know Father Des pretty well. He voiced concern over a letter that he had sent to a magazine [Macleans?] which they published against his expressed wishes. He had written it in reaction to an article touting the artificial insemination of cattle. Father had suggested that such 'scientific advances' might later lead to experimentation with human reproduction etc. [prophetic, I'd say]. He hadn't cleared the letter with the bishop, first, and this was a problem as well. On Monday, Labor Day, Bernard showed me the way to the school across Adam Lorbetskie's farm about a half mile. [Because I feared the horses that pastured there, I always took the mile long way up the lane and down the road.] Despite the broken gate and sagging fence in front, the exterior of the school looked fresh and clean. The log structure had been covered with a sort of grey stucco, embedded with crushed grey granite, and the eaves, window frames, and door, were painted white as was the privy in back. The door was trimmed in dark green. The inside was bright with light streaming in through five windows that ran down either side of the room. However, it looked and smelled old-- old books, oil cloth wall maps, dustbain, and mice. Behind the teacher's desk was a high, narrow, open-shelved cupboard that held several shelves for books and supplies. It was flanked on either side by blackboards.There were simple wooden desks, a teacher's desk and wall hooks for coats and jackets. I think a wood stove sat in the center of the room, but I have no distinct memory of it. I do recall clearly, though, that the older pupils were required to pile wood in the woodshed that spring. A young Polish woman, perhaps in her early twenties, who lived near the school with her two unmarried brothers, was caretaker. She kept the school clean and came every morning before we got there to make sure the school was warm. I don't think I ever saw her. Being Polish, her parish would have been Wilno. I think she was a Burchat. The school term began with the following pupils: John O'Connor 14, and his sister, Eunice 12 [Tommy's]; Bernard Sullivan 13 [ all three in eighth grade], Theresa Lorbetskie 11, grade 5; her sister, Dorothy 9, grade 3; Florian Zilney, a 10 year old Indian boy from the Golden Lake Reservation who lived for a short time with his sister who was married to Adam Lorbetskie. In the spring, when the weather was better, little Esther Lorbetskie, sister of Theresa and Dorothy, joined us to begin first grade. I think she spoke only Polish at home and she was so shy, in any case, that I could hardly get her to say a word. I felt very inadequate with all of them, but especially so with Esther. I sometimes remember all and hope that life has been goodo them. Kate had been Catherine McMahon, or maybe Macadam, from Admaston, and an R.N. She had a niece, married to a McHale, and this seemed to be her closest relative. Kate told me that she had worked as a nurse in Detroit for about fifteen years before meeting and marrying Big John. I believe that they met when she was visiting a friend in the area. Kate was a hard worker who did everything at a run. She kept her thin hair pinned up in a neat bun at the back of her head, wore glasses, and spoke in a hoarse voice. She kept the house hospital-clean and was a good cook. I never eat a baked apple that I don't recall the wonderful baked apples that she served with plenty of cream. Once that spring she showed me the root cellar. It looked like we were entering a door that led into the side of a very small hill. It was really a low-ceilinged structure, approximately 8 ft. by 1O ft. with a dirt floor and covered over by grassy earth. Inside were shelves of her jars of pickled beef and pork, jams, and jellies, pickles and relishes. In rough bins, were potatoes, carrots, onions, and turnips. It was my first visit to a real root cellar, and I left it with a new appreciation for Kate's hard work. She didn't dawdle at the end of any meal, but got up quickly, saying, "'This won't buy boots for the baby." She was called to the homes of neighbors to help with childbirth, and sometimes complained to me that she felt taken for granted. She had no patience for anyone who didn't pull his share of the load, and sniffed her disapproval of 'those indignants' on relief. I knew she meant indigents. She didn't leave the farm from the first heavy snowfall until the spring melt. During this time, her only diversions were the catalogs and the news at six in the evening. There was no telephone. By springtime, the isolation seemed to get to her, and she became nervous and short with us. No wonder. One Saturday in spring, all four of us set out in the car for Killaloe. On the way, we, encountered a small creek, really run-off from snow melt, that cut across the road, and Kate was terrified when the water came up to the floorboards of the car. It's the only time I saw her get angry with John and it was probably her fear that led to it Though they were not demonstrative in their affection, I could see that there was a strong bond between themselves and with Bernard . She had been at his delivery, or shortly after when his mother died. His father, Barney, was unable to care for this sickly newborn, so Kate brought him home. She and John became, in fact, his parents and they loved him There were no other children. I never saw Barney, but I think he still lived near Brudenell. Bernard Sullivan was quite thin and pale, but wiry. He suffered from severe boutsof asthma, and his allergies made it obvious that he could never take over the farm for John and Kate. This was a sad realization for all three. Many nights I would hear him wheezing and gasping in the next room, and then Kate getting up to give him medicine or a shot. Next day, he would be weak and pale. Big John might once have been a handsome man, but, when I was there, he was toothless. Not many people look good without teeth. He was known in the area for his long, closed-mouth laugh that started slow and low and ended in a high, loud guffaw. And he loved to laugh. He was hard-working, and cheerful and kind. During that year, he was notified that he had been left a sum of money by a relative in Ireland, but I don't know how much. He seemed surprised and confused by the news. That winter, he went to Toronto for the funeral of his brother. While he was there, a nephew took him to see a hockey match at Maple Leaf Stadium. This was one of the highlights of his life. You see, he had never seen a hockey game until then, but had listened to the broadcasts of them every Saturday night in winter, slapping his knee , and cheering when his side scored. I used to marvel that he could imagine a hockey match, having never seen one. I think it was this nephew who came, with his wife and small child, to visit late that spring She was newly pregnant. In winter, most Sundays, John hitched up the team of heavy work horses, and he and I set off for Mass in Brudenell. The horses, which he blinkered to keep them from turning around and heading back to the warm stable, plodded slowly toward our destination. After Mass, however, they wanted to run all the way home, and John had to strain to hold them back so that they wouldn't overheat. Bernard wasn't able to take the trip and Kate stayed home with him. One particularly snowy Sunday, we went to Mass at Wilno which was much closer, maybe 4 miles. The Latin Mass was the same, but the sermon was in Polish. In recalling this place and time, I want to pay tribute to these kind and noble people who made a difficult year bearable. I regret to say, that in moving on with my life, I lost contact with them. This recollection, then, is a Thank You and God Bless.